The president's unusual remarks came at the White House ceremonial swearing-in ceremony for the new Supreme Court justice on Monday night. 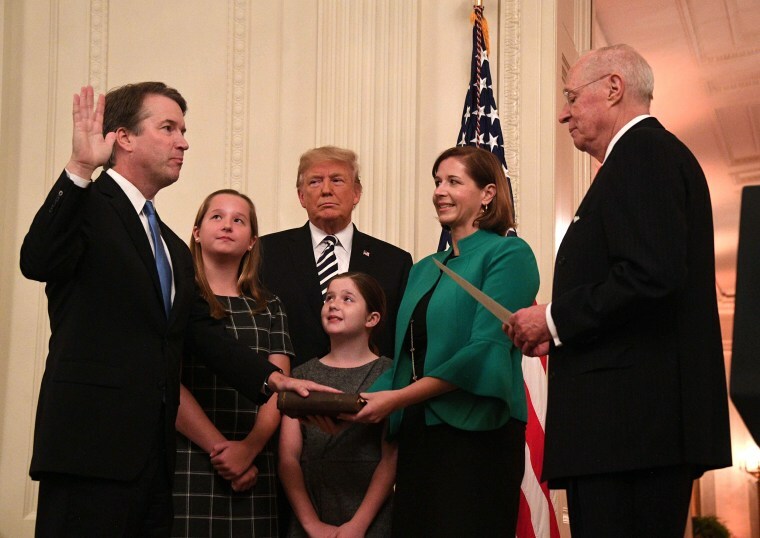 WASHINGTON — President Donald Trump, at the White House ceremonial swearing-in for Supreme Court Justice Brett Kavanaugh, offered an unusual apology to the judge and his family for his experience during the confirmation process. "On behalf of our nation, I want to apologize to Brett and the entire Kavanaugh family for the terrible pain and suffering you have been forced to endure," Trump said, adding that the confirmation process was based on "lies and deception." "You, sir, under historic scrutiny, were proven innocent," said Trump, as Kavanaugh and his wife, daughters and parents looked on at the event broadcast live and attended by all the other Supreme Court justices, congressional leaders and administration officials. There was no conclusion as to Kavanaugh's guilt or innocence in regard to any of the sexual misconduct allegations made against him. The FBI, in its supplemental background investigation last week, was not tasked with providing with a final determination as to his culpability. The White House event was ceremonial; Kavanaugh was officially and privately sworn in to the Supreme Court on Saturday after the Senate narrowly confirmed his nomination. The justice offered his own take Monday night on the bruising confirmation process, calling it "contentious and emotional," though he added that he held "no bitterness." "Every American can be assured that I will be an independent and impartial justice," Kavanaugh said on Monday night. "I was not appointed to serve one party or one interest, but one nation." Kavanaugh also said that he had kept a promise he made during his Senate testimony to hire only female law clerks, the first time a justice has done so. Historically, White House swearing-in ceremonies have taken place during the day and after the justice's work on the Supreme Court is well under way. Trump instead opted to hold the event before Kavanaugh's first official day on the bench and during an evening, less than a month before the midterm elections. Although Trump's latest Supreme Court fight may be over for now, he showed no sign of tamping down the rhetoric on Monday. Hours before the swearing-in ceremony, Trump told reporters that the sexual misconduct allegations against Kavanaugh were a "hoax" manufactured by Democrats. Later, at a law enforcement event in Florida, Trump called the claims against Kavanaugh "totally untrue," saying they were "brought about by people that are evil." Trump’s defiant comments are a far cry from the more restrained tone he took just two weeks ago, when he described Ford's testimony before the Senate Judiciary Committee as "credible" and said she seemed like a very nice person. Since then, Trump has escalated attacks against Ford, including publicly mocking her at a campaign rally.